The news that founding Pink Floyd member Richard Wright has passed away from cancer at age 65 will no doubt bring a barrage of stories detailing the assorted onstage/offstage twists and turns of the group's long career. And make no mistake: Over the years, the group's combination of both the bizarre and the bitter when it came to their internal affairs was as much a source of fascination to their legions of fans as their often brilliant music, which have generated enough album/CD sales that if laid end to end would probably stretch from the London architecture school where they first met in the early 1960s all the way to that dark side of the moon and back again--and probably a few round trip's worth at that.Trips, of course, of both the physical and mental variety, were what Pink Floyd's earliest recordings such as "Interstellar Overdrive" and "Astronomy Domine" were all about--especially in the day-gloed days before their original guiding force guitarist Syd Barrett went on a few too many of them and had to leave the group. 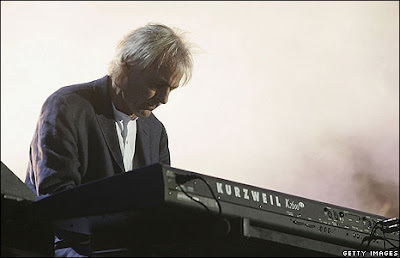 And while the emergence of bass player/songwriter Roger Waters and Barrett's skilled replacement David Gilmour certainly led the way for Floyd's ascension in the 1970s as one of rock's premier acts with 1973's aforementioned Dark Side or 1979's epic The Wall, it was in many respects Richard Wright's expansive keyboards that served as the musical compass that allowed Pink Floyd to continually (as the song said) "Set The Controls For The Heart Of The Sun. "Those familiar with the band's history probably know that it was during the recording of The Wall that the increasingly difficult to work with Waters forced Wright out of the band as an "official" member, leading to an increasingly period in the 1980s in which the keyboardist toured with his own group--as a salaried accompanist. It wasn't until the latter part of the decade after Waters finally left the band--and unsuccessfully sued Gilmour and drummer Nick Mason over rights to the Pink Floyd name--that Wright rejoined as a full member. (In the interim Wright released a solo album, fittingly titled Identity.) Anyone who saw Wright perform alongside Gilmour, Mason and yes, Waters, too, in their short but power-packed set at the Live 8 megaconcert in England in 2005 can attest to the still potent collective sound made by this ever-strange quartet of players. And wherever Wright and Syd Barrett (who physically left this planet a few years ago) may now be, here's betting they're plugging in and getting ready to check out that piper at the gates of dawn.